Niagara Falls, NY - The Third Street Retreat Eatery and Pub executive hostis Shelby Lisieski serves tourists Loren Ostrosky from Pennsylvania, left and Christopher Dokler of Ohio, right. The restaurant is participating in the Salvation Army and United Way of Greater Niagara "Dine To Make A Difference" event, where a portion of the day's sales go to charity. THE SALVATION ARMY OF GREATER NIAGARA FALLS AND UNITED WAY OF GREATER NIAGARA ANNOUNCES "DINE TO MAKE A DIFFERENCE"
[BUFFALO, NY, April 24, 2017]— The Salvation Army of Greater Niagara Falls and the United Way of Greater Niagara County announce a partnership within the community scheduled for Tuesday, May 9, 2017 called Dine to Make a Difference. 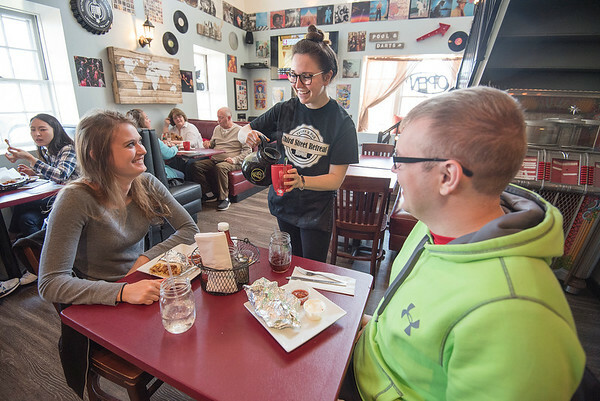 Local restaurants within the Niagara Falls community will be donating a portion of their sales for the day to The Salvation Army of Greater Niagara Falls and the United Way of Greater Niagara. The portion of the sales for that day will support the efforts to provide healthy food to people in need throughout Niagara Falls and all of Niagara County. If community members are unable to Dine to Make a Difference that day, donations are being accepted through the event. Checks can be mailed to: United Way of Greater Niagara Inc., 6420 Inducon Drive, Suite B2, Sanborn, NY 14132. Please mark them as “Dine to Make a Difference”. Restaurants may still register to be a part of Dine to Make a Difference by contacting Captain Stephen Carroll at 716-283-7697 or Stephen.Carroll@use.SalvationArmy.org. Since1884, The Salvation Army has been a vital link within Western New York’s human service network. We provide individuals, regardless of age, gender, education, ethnicity or religion with food, clothing and shelter, as well as social and spiritual support. The mission of The Salvation Army – Buffalo Area Services is to offer hope for a better life by meeting basic human needs. The Salvation Army, an evangelical part of the universal Christian church established in London in 1865, has been supporting those in need in His name without discrimination for more than 130 years in the United States. Nearly 30 million Americans receive assistance from The Salvation Army each year through the broadest array of social services that range from providing food for the hungry, relief for disaster victims, assistance for the disabled, outreach to the elderly and ill, clothing and shelter to the homeless and opportunities for underprivileged children. 82 cents of every dollar The Salvation Army spends is used to support those services in 5,000 communities nationwide. For more information, go to http://www.salvationarmyusa.org.